Hello, gentle readers, and welcome to the RPG Reload, the weekly feature where we deal exclusively in cows. Each week, we take a look at an RPG from the App Store’s past to revisit it and see how it’s doing in the modern day. It’s a chance for a bit of reflection and a deeper dive than the usual TouchArcade reviews allow for. The RPG genre is a pretty wide one that covers a lot of different kinds of games, and I try to present a good variety from week to week. That said, everyone has their blind spots, and to help cover mine, I ask for a suggestion from the readers to feature once per month. The next reader’s choice article will be in RPG Reload File 037, so get your choice in soon by commenting below, posting in the Official RPG Reload Club thread in the forums, or by tweeting me at @RPGReload. This week’s featured game might be the least traditional of anything I’ve covered so far. Some will say it’s not an RPG, and depending on how exactly you view the genre, you might feel it doesn’t even have RPG elements. As trying to strictly define what is an RPG is a venture that can only end in madness, I’m not going to argue with you if that’s how you feel. 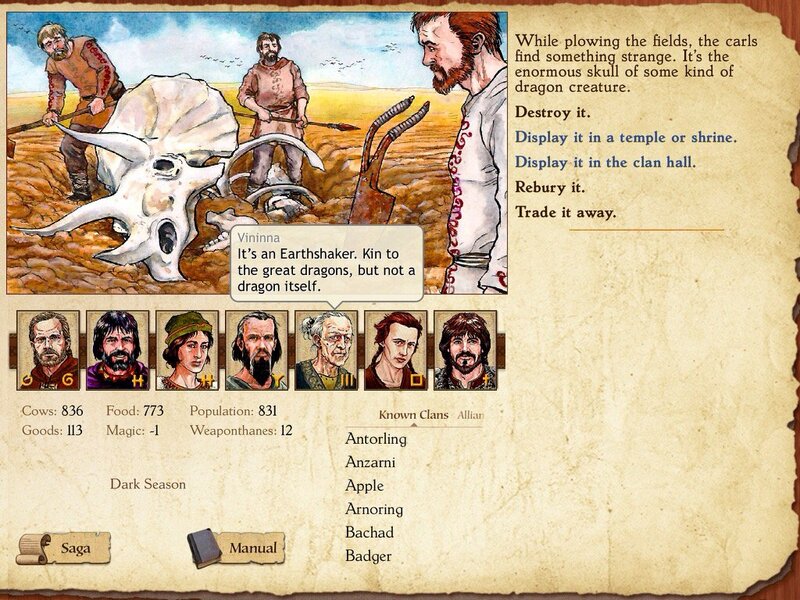 For whatever it’s worth, my own opinion is that King Of Dragon Pass ($9.99) is a highly unconventional mash-up of gamebooks, simulation games, and role-playing in the classic pen and paper sense. It’s weird, to be sure, but if I were only interested in covering games that fit the classic RPG mold, we would be on week 34 of Kemco games. Nobody wants that. 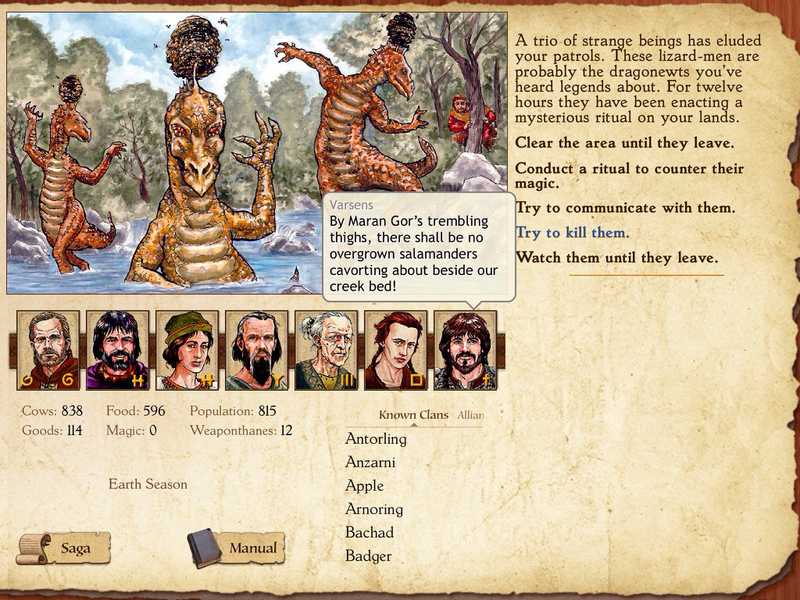 King Of Dragon Pass is an extremely unusual game, and that has been a double-edged sword over the course of its life. Developed over the course of three years by a very small team, the game released on PC in 1999 to a less than receptive market. It got a couple of middling reviews from American magazines, but by and large it was simply ignored in the US. It fared somewhat better with critics in Europe, but to little avail in terms of sales. According to an interview between the developer and Eurogamer, the PC version initially only sold 8,000 copies. To be fair to the game, that was as much on the state of the PC gaming market as it was on King Of Dragon Pass in particular. Digital distribution was still a few years away from being a feasible option, and unless you were signed with a big publisher, getting a piece of wall in the ever-shrinking PC section of video game shops at the time was nearly impossible. The game was likely going to have a hard time selling itself even if conditions were good, thanks to its humble appearance and hard-to-explain concept. In a climate where PC game sections were dominated by graphically impressive efforts from the biggest names in the business, it didn’t have a chance, no matter how happy the people who stumbled on it were. You could write a similar epitaph on the gravestones of countless high-quality games in our hobby’s history. In fact, I’m sure a few great games have come out this week that will go largely ignored and disappear into the sands of time. It’s a merciless thing, creating art. Fortunately, that’s not the end of King Of Dragon Pass‘s story. Interestingly, the game’s second swing at the ball happened on the back of another company’s desire to try again where they had met with weak results. When designer David Dunham had first conceived of King Of Dragon Pass, he had actually thought to put it on Apple’s Newton, a PDA that some of you are likely familiar with. The Newton was ahead of its time in many ways, but even though it had its fans, it was ultimately discontinued due to poor sales performance. 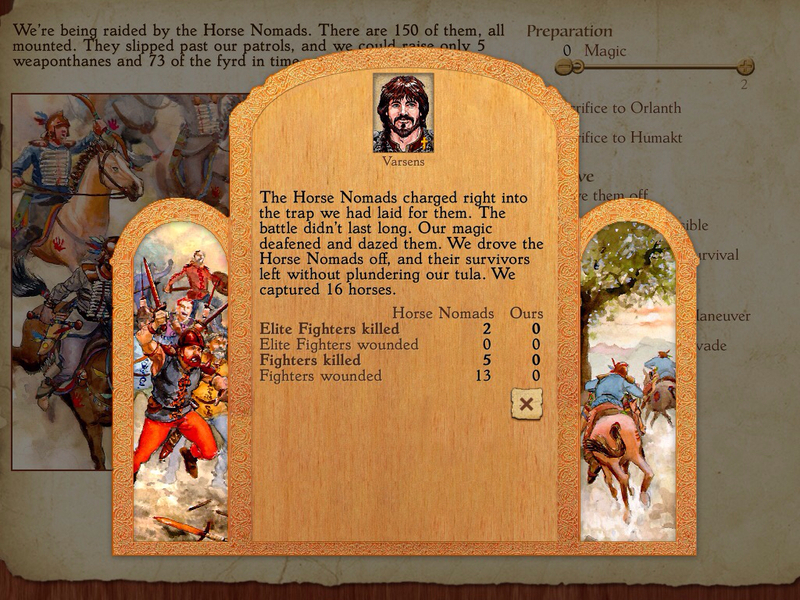 That resulted in King Of Dragon Pass going to home computers instead, but the idea of a handheld version apparently scratched at the back of Dunham’s brain. When Apple unveiled the iPhone, that scratching got a little more urgent. After he determined the game could work, he hired someone to help him bring it to life and got to work. It took a few years before it hit iPhone in September of 2011, and another year after that for the iPad version to hit, but the game took to both devices very well. And like Apple’s second crack at the pocket computer market, King Of Dragon Pass made a triumphant return, piling up favorable reviews and selling well beyond the original version’s numbers. Its popularity resulted in an Android port and a return of the PC version on GOG.com. Both suddenly and at long last, King Of Dragon Pass finally reaped some rewards. There’s even talk now of a spiritual successor to the game. I love a happy ending, don’t you? I suppose I should explain what exactly King Of Dragon Pass is, now that the history’s out of the way. It’s set in the world of Glorantha, a pen and paper setting that used to be a pretty serious rival to Dungeons & Dragons in some places. You take the role of a clan chief, and the ultimate goal is to become, well, the king of Dragon Pass. To put things in their simplest form, there are two different styles of gameplay working together here. One part is a simulation game not that far removed from something like Civilization, asking you to manage the resources of your clan to try to be as prosperous and strong as possible. The other side of the game is set up like a gamebook, presenting you with events and asking you to make a judgement call. Your choices here will usually have an immediate impact on your resources and the stats of your clan, but they’ll also have long-term effects that you might not see coming until they jump out at you after in-game years. These two halves are intertwined beautifully. Your efficiency at running the sim side determines in part which scenes you’ll be presented with from the hundreds of possible events, while your choices in the events have a strong influence on almost every facet of your clan. You have to learn how to handle both sides harmoniously to shape your clan the way you want it. While the overall goal is always to become the king, there are many roads that can take you there. You can unite the clans under an iron fist, grease political wheels to make alliances and friendships, rely on the strength and security of a powerful economy, or make use of a number of other strategies. 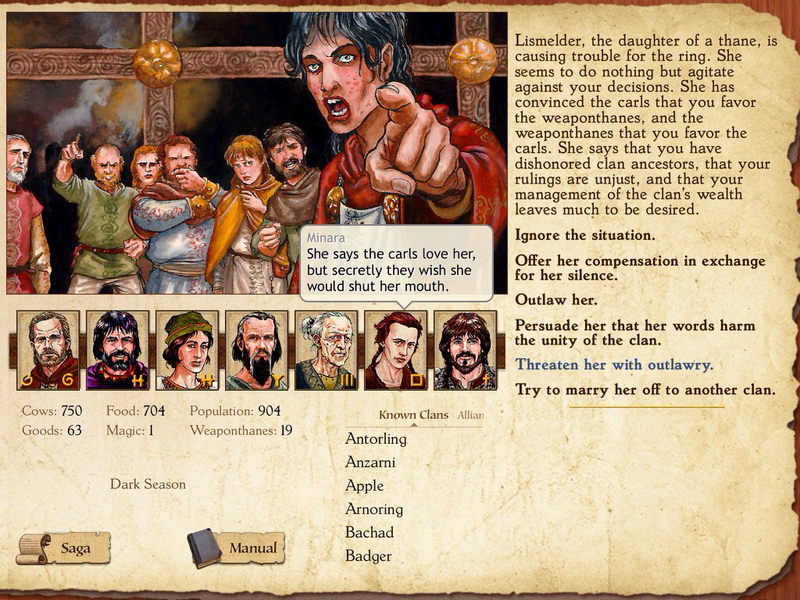 King Of Dragon Pass is not a game that pushes right or wrong decisions at you. As in life, almost any action you take has costs and benefits. It’s why I make reference to harmony when I describe the gameplay. If you don’t have the long game in mind, you could easily end up undermining yourself at every turn and going nowhere fast. That quality of the game is perhaps best exemplified by the clan ring, a group of seven advisers who you can consult on just about every decision. Like any randomly-chosen group of seven people, they usually don’t see eye to eye on things. You’ll have to choose if you want to follow the majority opinion, stick with a particular adviser, or just go your own way, but whatever you do, consistency is vital. You won’t be able to please everyone and trying to do so will only lead your clan to disaster. 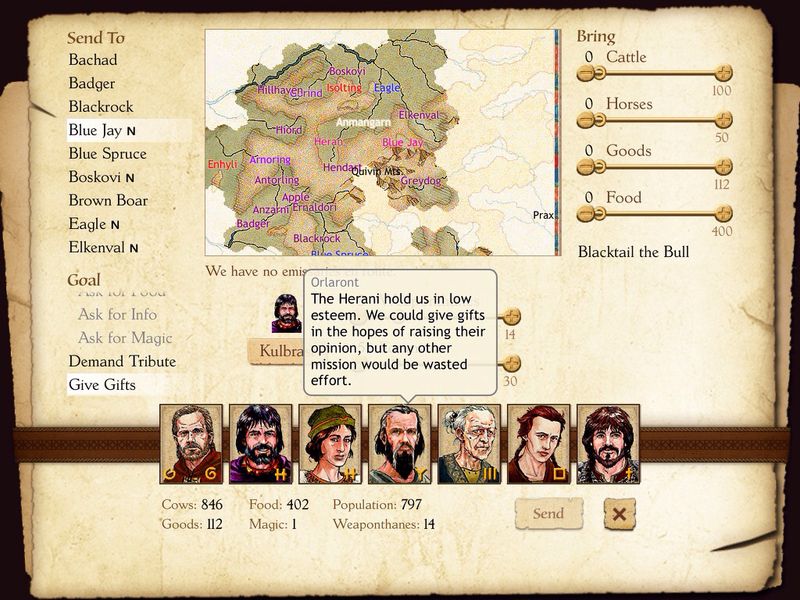 Like many things in King Of Dragon Pass, the advisers work equally well towards the story and the gameplay. Their personalities help lend the story some continuity and character, while their advice acts as a practical tool to make the game more accessible. While the game has a massive manual that you should certainly read if you want to play the game at your best, you can also learn a lot just by jumping in and following what your advisers say for your first game. Glorantha makes for a very interesting setting for the game. For good or for ill, the settings in most fantasy RPGs are derivatives of Dungeons & Dragons, itself a somewhat expanded variation on Tolkeinian lore. Glorantha feels very different. While it’s just as fantastical as that well-trodden style, Glorantha has a much heavier emphasis on its mythology. The creator of Glorantha, Greg Stafford, wanted to try to deepen his understanding of mythology through his creation. His world ends up fusing elements of Joseph Campbell’s monomyth theories into a Conan-esque world of battling barbarians, downtrodden peasants, and capricious yet almost entirely unseen gods. It’s the latter aspect in particular that you need to keep in mind as you play the game. Glorantha has a rather large pantheon of gods and if you choose to ignore them, it’s at your own peril. Maintaining shrines to multiple gods puts a strain on your resources but earns you many favors, and you never know who you might offend by not worshiping the right one, or even worse, worshiping the wrong one. Here again, consistency is key. There are too many gods to properly devote yourself to, so try to find that ones that align with your goals. While the simulation foundation of the game is rock-solid, a lot of the fun comes from the events. It’s absurd how many different situations can come up, and the game is a real fan of asking you to throw a brick up in the air so that it can land on your head later. Although these events are presented with nothing more than still drawings, the quality of the writing helps bridge the gap in your imagination. 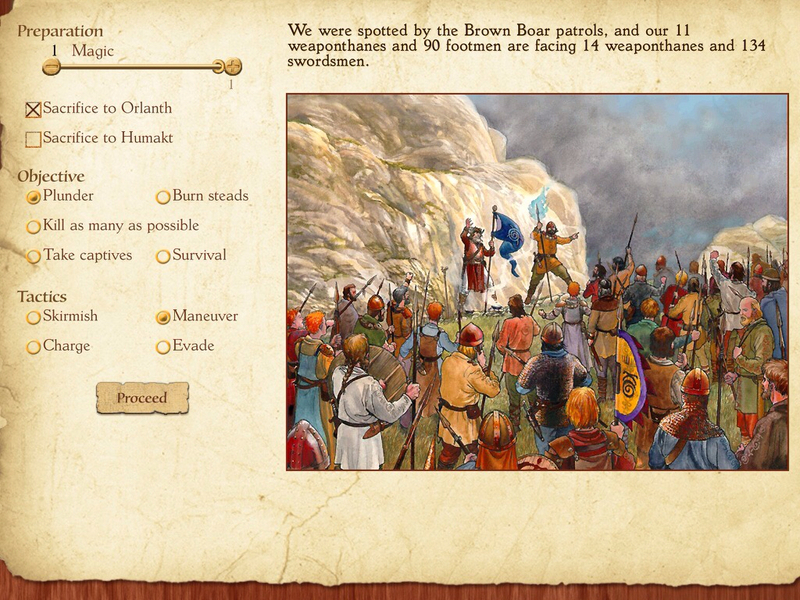 Because of this part of the game in particular, King Of Dragon Pass is a blast to replay. I’ve run through the game several times before I did the playthrough for this article in particular, and very few events have ever repeated for me. I’d love to see what the logic for this game looks like behind the scenes, because in action it’s almost magical. Things seem random at first, and sometimes they are, but more often than not, the events you come across have a lot to do with the decisions you made earlier. Even once you get to the point where you’ve played enough to have seen most of the events, you’ll still get the odd new one pop up under very particular circumstances. It’s a game that dares you to play around and rewards you handsomely for it. The game keeps on growing, too. The developer has made numerous updates to the game since its initial release, adding in dozens of new scenes and improving the interface in various ways. It has support for iCloud, a variety of screen sizes, and has updated diligently after each iOS update to ensure that things are still working correctly. All of the added content is delivered at no cost to the player, too. The developer has even considered things like iPad Mini owners possibly wanting to increase the text size on their smaller screens. The treatment given to this game is above and beyond what anyone could expect, and I’m absolutely certain the app will continue to live vibrantly into the future. I’m also quite impressed at how well the interface fits both devices. I personally prefer the iPad layout, but there’s nothing wrong with the way it looks on the iPhone if that’s what you’re sporting. It’s a great game that ported thoughtfully and has been meticulously cared for, and it’s just the kind of thing I love to write about in these features. That’s just my opinion on King Of Dragon Pass, though. What do you think? It’s kind of a strange game, so I’d love to hear everyone’s thoughts on it. Drop a comment below, slide on in to the Official RPG Reload Club thread, or skateboard over to Twitter and tweet me at @RPGReload. Don’t forget to throw in your thoughts for the next reader’s choice while you’re at it. As for me, I’ll be back next week with another great RPG. Thanks for reading! Next Week’s Reload Hint: We have to start thinking 5 Dimensionally.